At the end of Term 3, the 2017 BGS Percussion Awards took place in the Senior Music Centre, giving the percussionists, who are sometimes overlooked but play a vital role in keeping the orchestra together, a chance to step into the limelight. 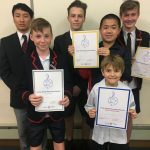 Now an annual event in the BGS music calendar, the awards seek to give the percussion students in the Junior, Middle and Senior Schools an opportunity to strive for excellence through preparing two solo repertoire pieces to be performed in front of their peers and an exacting adjudication panel. The pieces must include a tuned percussion piece (marimba, xylophone, vibraphone) and a non-tuned instrument (drum kit, snare drum) to reinforce the diversity that is expected within the Percussion Department.